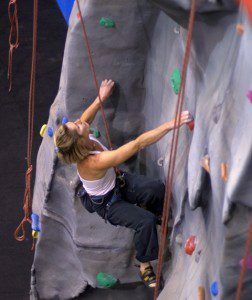 As climbing is becoming notably prevalent in the media, more and more people are turning to indoor climbing walls as a way to learn a new skill and/or to tone up the body. It is a fun way to keep fit as it uses all the muscles in the body and engages the mind too. It’s also a great way of meeting new people. Any introduction to Indoor Climbing must be done with a qualified instructor to ensure you learn in a safe and precise way and Monsterclimbs will give you the most comprehensive initiation into climbing you are likely to find. Monsterclimbs run Learn the Basics Course at The Warehouse Climbing Centre in Gloucester or at Undercover Rock, Bristol as a one day 6 hour course – plus a break for lunch. All participants will start on and return to the ground. By the end of the course you will be an independent climber and belayer and will be able to go to any climbing wall without supervision. Adopt the correct lowering position. This intensive 6 hour course costs £75, including kit hire and entry to the centre. There is a minimum of 2 people and a maximum of 6 people for this course and a minimum age of 14. 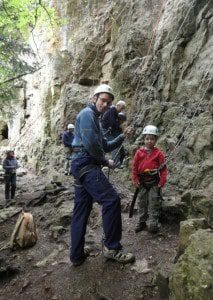 For those of you who have climbed indoors and want to move outdoors onto real rock, or you just fancy having an outdoor climbing experience. It is the first step to a lifelong activity that will enable you to access areas you have only dreamed of and will keep you fit too. You may think you are too scared of heights to give it a go, but everything will be geared to your needs and at Monsterclimbs customers always start from the ground – it’s up to you how far you go. It’s not getting to the top that counts but the journey and the learning that takes place. How to put on a helmet and harness correctly. How to tie a figure of 8 knot. How to fit and use specialist climbing shoes. How to belay using a standard belay device or Gri Gri. How to lower safely and in control. Be able to recognize that a tiny piece of rock is a foothold and will take your weight. How to climb using good footwork and pushing with the legs. How to climb by transferring weight from one foot to the other. Learn how to use static and dynamic balance. Maximum of 6 people to ensure quality instruction. Venue: Symonds Yat. See Calendar for dates available. Cost: £80 per person – minimum age 14. Family or group days are Taylor made to make you feel comfortable and safe in the outdoor environment. Groups are kept small to ensure everyone has quality instruction with equipment to suit every shape and size. The days can be children only, family days including parents or a group of friends, hen or stag parties. Ali Taylor holds an AALA Licence so children do not have to be supervised. All equipment will be provided. Participants will learn everything they would on the Moving Outdoors course and will take an exciting journey to and from the rock face, stopping for lunch so everyone can make use of the facilities including the cafe at the Peregrine look out. Maximum of 9 people to ensure quality instruction. Venue: Symonds Yat. See Calendar for dates available. Cost: £60 per person – £40 each for under 14’s – minimum 2 people includes use of all equipment. 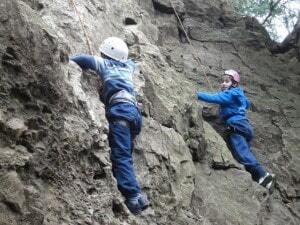 Meet at Symonds Yat at 10 a.m, finishing at 4 p.m. 10% discount for group bookings. Lunch either at the Yat is not included. Family/Group Days can be booked as bespoke courses. Please contact Monsterclimbs if you wish to book a private course for your family and/or friends.